The allotment is still producing large amounts of cucumbers and courgettes, and there are still the last few green beans too. 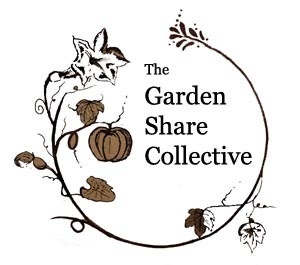 This reminded me that some of this produce should be preserved in order to keep the plot providing into the autumn and winter. I’m a fan of chutneys and pickles. They are both a great way of using up a glut at the plot, and a delicious (and vital) component to any cheese and cold meat dish. The Festive Period is not the same without a chutney or pickle. During a mini break in April, my wife and I stayed at the fantastic Bull Hotel in Bridport and enjoyed some amazing pigs head croquettes, accompanied by piccalilli. It was a delicious dish and I’d like to recreate some time. I can’t very easily get hold of a pigs head, but the crop of cucurbits at the allotment have provided me worth the ingredients for an allotment piccalilli. 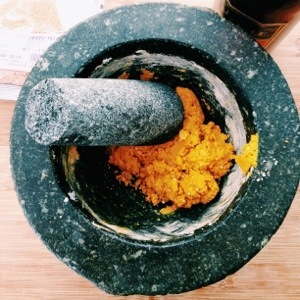 The Oxford English Dictionary traces the word piccalilli to the middle of the 18th century when, in 1758, Hannah Glasse described how “to make Paco-Lilla, or India Pickle”. The use of spices like cumin, coriander and turmeric give the pickle an Indian feel and vibrant colour, but it is an archetypal English preserve. As a fan of Pam Corbin’s River Cottage Handbook: Preserves; I based my own piccalilli on her recipe, using a combination of courgettes, cucumbers and dwarf green beans as the vegetable content. Cut the vegetables into even bite sized pieces. 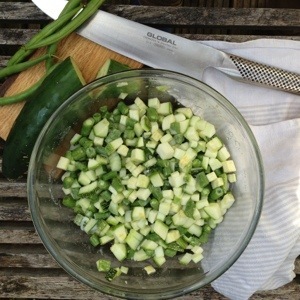 As I said, I used courgettes, cucumber and dwarf beans (but you could use pretty much anything). Sprinkle with salt, mix well, cover and leave in a cool place for 24 hours. Rinse thoroughly with cold water and drain to remove as much water as possible. 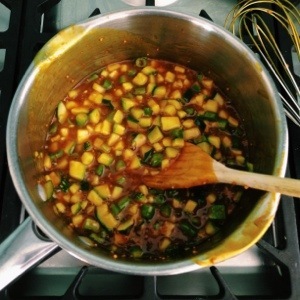 Blend spices and cornflour to a smooth pasted with some of the vinegar. 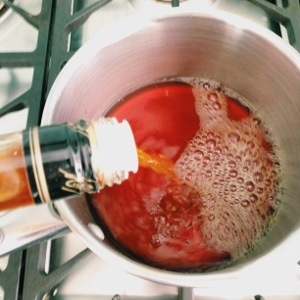 Put the rest of the vinegar, sugar and honey in a pan and bring to the boil. Pour some of the hot vinegar over the spicy paste, stir well and return to the pan. Bring gently to the boil for 3-4 minutes to thicken and flavour the sauce. Remove the pan from the heat and carefully fold the vegetables into the hot, spicy sauce. Pack the pickle into warm, sterilised jars and seal immediately. 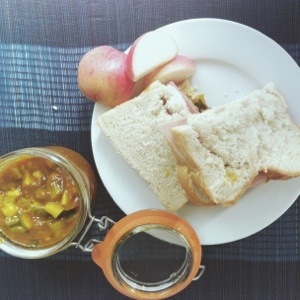 Pam Corbin recommends leaving the piccalilli for 4-6 weeks before eating (to allow the flavours to mature), but that was too long to wait, so a week later I opened the deliciously fragrant and crunchy pickle to accompany a nice ham sandwich.